The versatile, explosive Ratuvou first appeared on the international scene during the Fijian northern hemisphere tour in 2005. Ratuvou made appearances against Wales and Italy and played the full series of IRB Sevens for Fiji the following season. 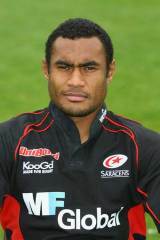 Having been playing amateur rugby in Fiji, Ratuvou made the switch to the Guinness Premiership with Saracens in the summer of 2006. Ratuvou's ability to play at centre, wing and full back and his fierce combination of pace and power make him a dangerous weapon in the physical world of the Premiership. During his two seasons to date with Saracens he has topped the try scoring charts, with a strike rate of 23 tries in 46 appearances for the London club. Ratuvou was part of the touring Pacific Islands team in the autumn of 2006, scoring three tries in his two appearances against Scotland and Wales. His first season in professional rugby was a great success; with a Premiership try tally of 11 guaranteeing him a place in the 2007 Fiji World Cup squad. Ratuvou was instrumental in Fiji's run to the quarter finals, playing all of their games at full back. His brace in the group game against Canada included a vital last minute effort that blew the group wide open ahead of their stunning victory against Wales, leading to their valiant quarter final defeat to South Africa. Ratuvou returned to Saracens for his second season at the end of the tournament and was able to improve on his first season tally with 12 touchdowns. His efforts helped Saracens to the Heineken Cup semi finals for the first time, although his try against Munster at that stage was not enough to see them into the final. Ratuvou returned to international action for Fiji in the Pacific Five Nations in the summer of 2008, playing at centre in their victories against Japan and Samoa. He also returned to the international stage in the autumn, playing in the Pacific Islanders northern hemisphere tour.